"Invasion of the Triceratons, Part 2"
Earlier. Commander Zom is rescued from the Foot Soldiers by the remaining Triceraton Commandos. Jennika throws a smokebomb and uses the cover to take down more Triceratons. Zom orders her Commandos to retreat into the subway so they can regroup. In the chaos, Splinter has Jennika take Bishop captive. 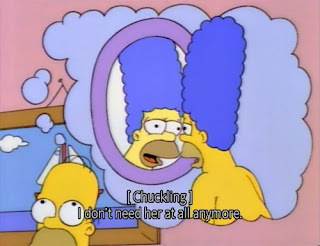 Now. The Turtles overlook the chaos in New York on their way to TCRI. They suspect that the Triceratons, their allies, have come to Earth because of them. Reaching TCRI, April gives them an update on the situation and says that the Triceratons are still in hiding somewhere. Baxter Stockman unveils his miniaturized Flyborgs which he sends out into the city to search for the Triceratons. He then gives Donatello the remote and tells the Turtles to get lost so he can finish his "crisis aid for profit" scheme to milk the imperiled city out of money. Meanwhile, a Flyborg finds the Triceratons in the subway as Zom orders Lieutenant Trokk on the mothership to prepare a larger invasion force for teleportation. 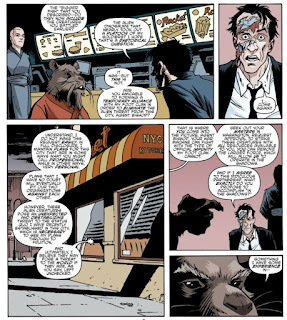 At a fast food joint, which is a front for the Foot Clan, Splinter and Jennika have a talk with Agent (John) Bishop. Bishop knows all about the Foot Clan and Splinter knows all about the EPF, so with that covered, Splinter suggests a temporary alliance. 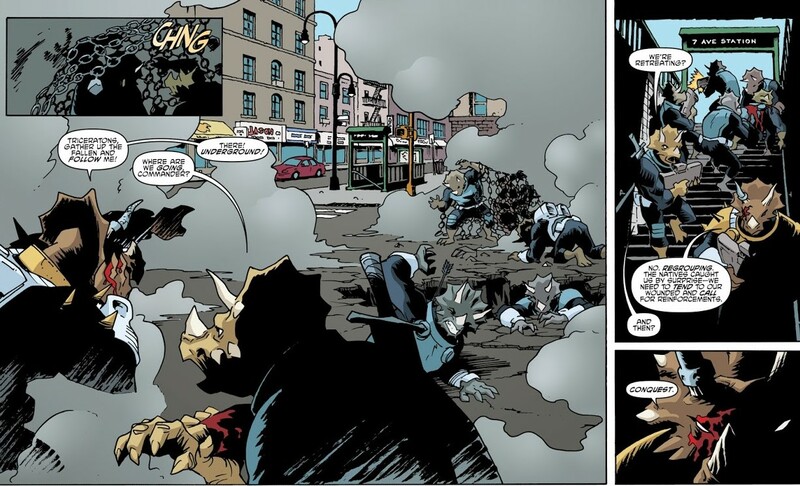 If the EPF can use their full military might to strike the Triceratons out in the open, that would leave the Foot Clan free to go after the leadership from the shadows. In the end, it will help Splinter in his agenda for New York while Bishop gets the joy of exterminating more non-humans whom he considers Earth's ultimate threat. Down in the sewers, the Turtles find Zom, who is happy to see her allies. She tells them all about their peaceful intentions until Bishop drew first blood (as well as the Neutrinos awarding Earth to the Triceratons). She also mentions the Foot Clan and Splinter, which the Turtles decide to clam up about. Zom then leads the Turtles and her Commandos to the streets where the Triceraton invasion force has begun to teleport in. 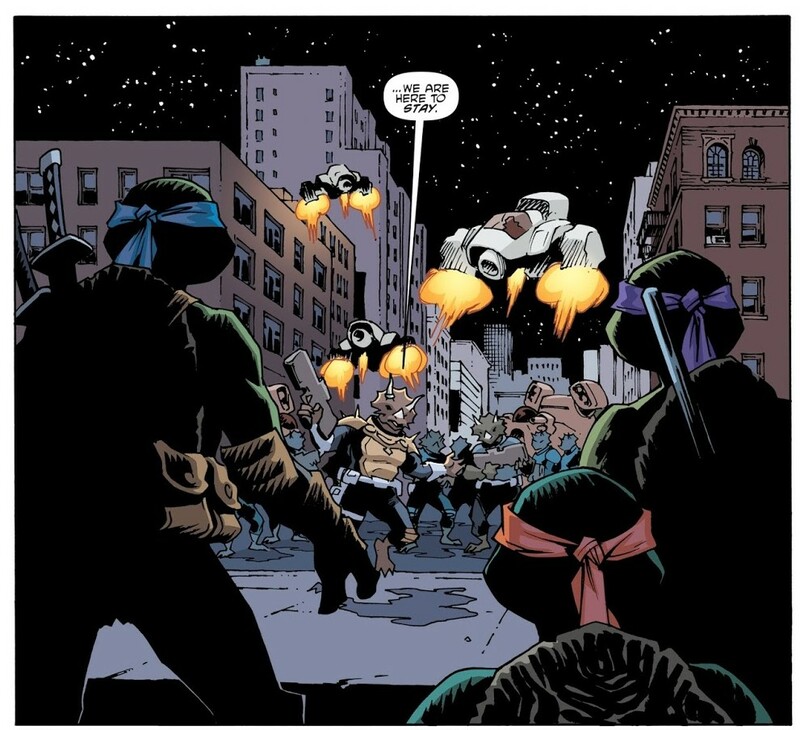 *This story is continued from TMNT (IDW) #76. 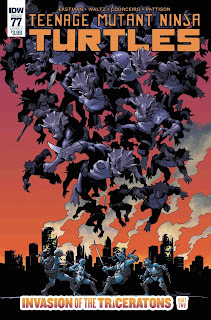 The story continues in TMNT (IDW) #78. 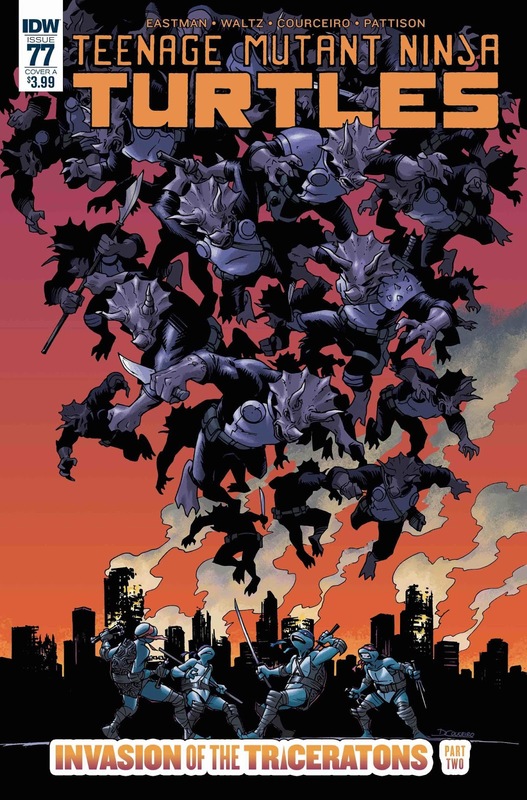 *The events of TMNT Universe #18 take place between this and next issue. *This issue was originally published with 3 variant covers: Cover A by Damian Couceiro, Cover B by Kevin Eastman and Tomi Varga, and Retailer Incentive Cover by Valentine De Landro. If there's one consistent trait I've liked about IDW Splinter, it's how pragmatic he is. The guy is rarely opposed to forming alliances with enemies if it furthers his agenda. He previously made shady deals with Old Hob and the then-fledgling Mutanimals; now he's making strange bedfellows with Agent Bishop and the EPF. This Splinter exists in more of a grey area than other incarnations, and it makes so much sense. Hamato Yoshi worked for a gang of ASSASSINS, after all; hardly a heroic band of do-gooders. He has his sense of honor and other enviable qualities, but to call him a "good guy" is stretching things a bit. By implications alone, we know he must have done a lot of awful things in the past, maybe just to put food on the table for his family, but reprehensible nevertheless. Seeing Splinter exercising those qualities in the present narrative has made him possibly the most interesting version of the character to date. The cartoon Splinters were always sanitized for younger audiences, as to be expected, and strictly heroic. The Mirage Splinter had darker undertones to his background and motivations, but they were rarely explored (either because he dropped out of the narrative as a primary character early on, or due to inconsistencies in rotating staff and guest writers for later stories). IDW's Splinter, like so many of their other versions of classic characters, has much more going on and they aren't afraid to explore it even if the results are unflattering for the character. The uneasy alliance the Turtles have made with Baxter Stockman (taking a cue from their dad when it comes to teaming up with former enemies?) isn't quite going the places I was hoping it would. Thus far, all Baxter has amounted to is a replacement for Harold. It makes Harold's absence feel all the more inconsequential, now that the Turtles have just said "meh" and hired one of the other super-geniuses they have in their Rolodex. Hell, Baxter isn't just filling in for Harold's technical specialty, but he's even offering Harold's grouchy banter. We're supposed to be missing Harold, I guess, but with Baxter around it's like he never left. Good cliffhanger, though! Knew we'd get one like that at some point in a storyline titled "Invasion of the Triceratons" but that doesn't mean I didn't enjoy it. That said, they probably shouldn't have let Zom's dialogue trail off and then pick back up between the two-page spread. It ends up making Zom sound like she's waiting two or three minutes before completing her sentence. Use your words, lady! I agree that this is the most morally grey version of Splinter. 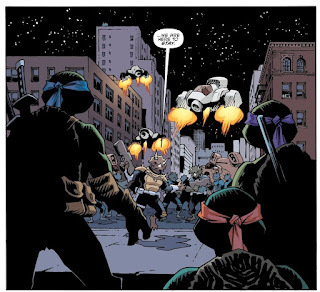 But what some readers may overlook (if they haven't read it first), is that the TMNT/Ghostbusters 2 arc was such an important family development arc that it seemed to be preparing readers for an imminent major update in family dynamic. TMNT/GB2 not only helped Mikey come to grips with some of the complex psychology of the situation (with a bit of help from Venkman), but the arc's finale helped all four brothers come to terms with their father's decisions (with a bit of guidance from their mother). And it helped them come to accept that Darius Dun was genuinely a threat to them. It didn't necessarily justify the methods Splinter used, but it justified his assessment of Dun's character, and seems to try to convince the reader (along with the protagonists) to cut Splinter a little more slack. So here, immediately, we're presented with situations where Splinter is making some very questionable decisions. Are they the right decisions? Are they tragically wrong? The previous arc practically begged everyone involved not to give up on Splinter, but Invasion of the Triceratons is making it increasingly clear that no one should necessarily be excused from questioning his decisions. This may sound contradictory, but I believe it's not—he's a complex character that should be judged from many different angles, and the story has been reminding us at different times just how many different angles we should pay attention to. As for the Triceratons and their situation, I feel a great deal of sympathy, and it's clear the turtles feel this as well. The Triceratons didn't deserve the treatment they're getting from Bishop or from the Foot Clan. I also think that they genuinely deserve some kind of amicable resettlement on Earth, though if that's never been a simple question for humans who have never left the planet, it's going to be even more complex for the Triceratons. Zom has been played a very bad hand—not just recently, but throughout the history of the Triceratons—and she's doing the best she can with it, and making use the few good hands she's been dealt for all she can. She's a good leader and I respect her. As for your Stockman complaint, YES. YES. I started observing this since Pantheon Family Reunion. The character whom Honeycutt once assessed as the greater evil, suddenly reduced to glorified tech support, made pliable with the promise of money. The story has recast him as a suspiciously similar substitute for the absent Harold Lillja, and it's not necessarily a good thing for either character. In this sense, I think Mirage ultimately handled its version of Stockman better, where it didn't just say he was an unstable sociopath, but showed it to great effect in both volume 2 and in volume 4. And I can certainly believe a version of Baxter Stockman who's more of a functional sociopath—being more inclined to behave if he calculates that doing so is in his best long-term interest—but this story has gone further and practically defanged him with simple profit motive. So either you believe every profit-chasing capitalist can be just as evil as Stockman is supposed to have always been (not necessarily a far-fetched argument in the history of human philosophy), or you believe personalities like Stockman can be effortlessly transformed into cuddly support characters with an easily-placed carrot and practically no stick. Spike in the Buffyverse had the plot device of the brain chip that prevented him from acting out. David Xanatos from Gargoyles had the more humanizing influence of a wife and son to transform his character development. Stockman's constraining plot device is...capitalism? Really? He shouldn't be that stupid, and we shouldn't be that stupid as readers, and it's lazy writing to just shoehorn him as Harold's replacement in this fashion.